First he had us eating Vegemite sandwiches and now it’s time for the main course. 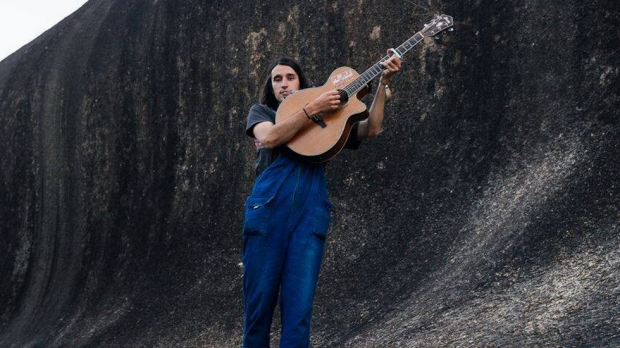 Jack Davies and the Bush Chooks have readied their new single. They’re going to have us devouring new single Rosemary Mushrooms at their launch on Sunday, January 27 at The Aardvark with Frank’s Fish Tank and New Nausea. RTRFM’s Breakfast presenter TAYLAH STRANO reports. It’s not the first time we’ve heard Rosemary Mushrooms, it made its way into your The View From Here set for RTRFM, how long have you been sitting on it? Jack: [The View From Here] is pretty much just after we started playing it. We’ve been playing it for a good few months, I wrote it half way through last year. Who’s currently makes up the Bush Chooks? We’ve got Chet Morgan on drums, he’s a new addition; our old drummer Jack got too busy with other things, so we’ve had him [Chet] for the past little while now and it’s been great. We’ve got Jack on the bass; he’s always been on the bass, apart from my friend Sam who started the band, but left because he’s too busy with sound engineering. We’ve actually got Sam to help do the mix on the single; he’s still kind of in the mix. George is on the guitar. Elise, who only joined six months ago – the violin just found its place and stuck here. Then there’s hector on the keyboard and Germaine doing some percussion for us. I was reading a previous X-Press article recently; you were cooking mushroom burgers, is that where the single came from? Basically, he [Kavi Guppta, reporter] wanted to do an activity, and I like to eat and cook sometimes, so he came around and I cooked him lunch. I made rosemary mushroom burgers because I thought it would be funny but turns out he didn’t actually know that song, and our interview was about a different song. It was a missed opportunity! I basically cooked that whole meal to make that joke but it went over the head. I just assumed he knew what I was doing but he didn’t. It was pretty intense and kind of scary cooking for someone else anyway, but then cooking and they’re documenting it. There was a photographer doing all the pictures, I was cooking eggs and he’d say “let me just get an angle”. He was all on my frying pan, all up in my grill literally. It was a lot! Yeah the old oven, the wood fired oven. But we don’t use it as a wood fired over because it doesn’t work anymore. It’s got a huge iron thing on top, it’s a good cutting board.